Oats are an important staple in any kitchen for maintaining stable energy, mood, and hunger levels. Bananas, are in almost every household, and they’re one of the most amazing mood-boosters, as well as providing plenty of potassium and electrolytes. Walnuts are known as the food to up your brain power (click here for more on brain foods, and some hints as to why walnuts are such a good food to feed your brain)…. 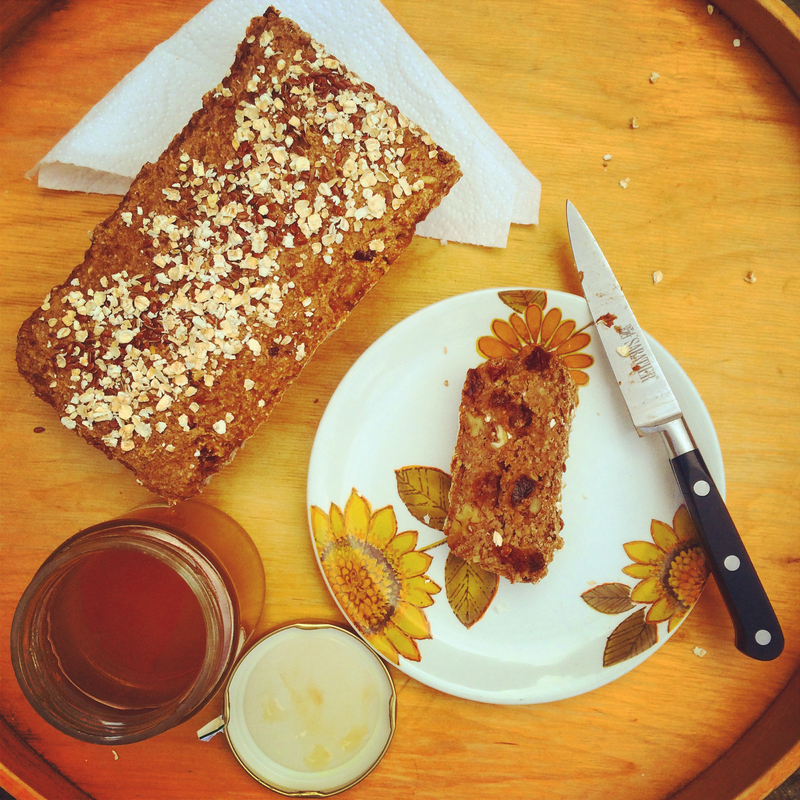 So what happens when you mix them all together into a delicious loaf of breakfast bread?…. You have a really good day, that’s what…. 2 tbsp ground flax added to 6 tbsp water to make a flax ‘egg’. You could also use 1 or 2 chia eggs, but I still need to test this recipe out with chia! Place in the oven at 175C and bake for 45-60 minutes. It may need a little less or a little more time depending upon how much you grind the oat flour, and the type of oven you have. Keep checking on the loaf every half an hour or so, and you’ll be able to smell it when it’s done. Ideally serve a slice of this for breakfast with a big green smoothie on the side and get a whole load of vitamins in one sitting, although it’s also delicious as a mid-afternoon satisfying snack with coffee, or as a dessert with vegan nice cream!If you’re looking to get healthy or maintain your new-year’s wellness promise to yourself, pick foods your body and mind loves, and the rest will take care of itself….